When four Portland, Oregon-area TV stations needed to access the upgraded ODOT IP camera system for their traffic reports, they turned to High Resolution Systems for their Enterprise control and automation platform solutions. The Oregon Department of Transportation (ODOT) maintains some 200 traffic cameras across the state and in southern Washington. Last year ODOT replaced its analog camera system with a digital system requiring a new interface for NBC affiliate KGW-TV, ABC affiliate KATU-TV and CBS affiliate KOIN-TV, all in Portland, and the FOX affiliate KPTV in nearby Beaverton. The new HRS Enterprise control system is designed to control and switch IP cameras on a Cameleon server from FLIR 360 Surveillance. The Cameleon server then sends four switched IP camera streams to each station, which are decoded by IONODES IP video decoders that output HDMI video signals to HDMI switch. The HRS Enterprise control servers handle the logic behind the system to give the end user a graphical interface with the ability to create a playlist of upcoming traffic cameras for traffic reports. Users can access the system from a network browser or a tablet on the set with full functionality of the user interface. The four broadcasters all have similar set ups; they include customized features requested by the stations, such as an automatic rotating display of traffic cameras for their website between traffic reports. “What’s great about HRS is their flexibility – you take a concept to them and they work with you to develop a custom solution,” Waikart says. “HRS worked with four broadcasters and a state agency, ODOT, to build the system from scratch. Getting everyone talking to each other wasn’t always the simplest thing! 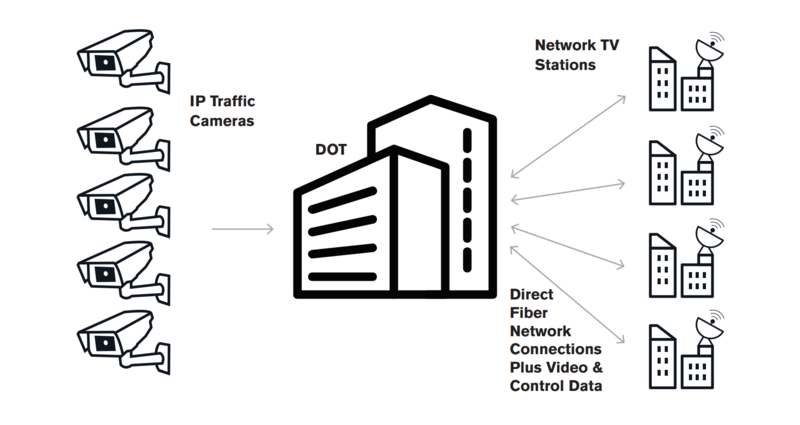 “HRS also had to design a system that communicated with three devices: ODOT’s own IP camera switching server, an HDMI switcher and a graphics system that displays lower thirds to title the traffic cameras displayed on air,” he continues. 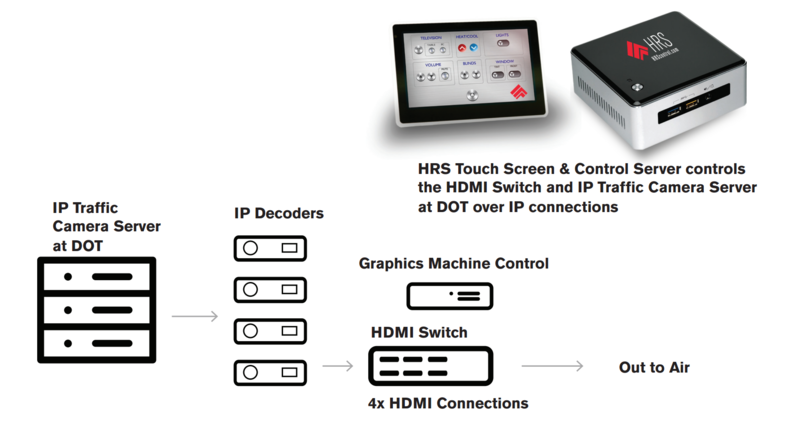 In the case of KGW-TV the HRS Enterprise control system interfaces with an Apantac HDMI Clean Switch, a Portland-made switcher that handles HDMI natively, and Vizrt’s Viz graphics system. Traffic reports for the metro Portland area are a fixture throughout the day on KGW-TV. They begin during “KGW Sunrise News,” which airs from 4:30-7:00 weekdays and are cut into telecasts of the “Today Show” until 9:30 am. Traffic reports resume during the “4pm News” and any traffic-related updates or emergency road reports are broadcast as needed. HRS will be exhibiting at NAB in the P.I. Engineering Booth, #SL7425. is a company with a strong systems engineering and applications background. Its founders have decades of experience in the audio visual rental and staging industry, broadcast applications, A/V installations and system design. This combined experience allows them to provide the highest possible quality solutions to its customers in the most efficient manner. For more information, visit www.hrscontrol.com.